"What if we looked at the river's needs first?" asked Sheila Kennedy, the architect and designer in a telephone interview. "Our thinking was what's good for the river has got to be good for people and economic growth, if it can be handled sustainably." The RIVERFIRST Project, led by the Tom Leader Studio (TLS) and Kennedy & Violich Architecture, Ltd. (KVA MATx), was selected today as the winner of the Next Generation of Parks Design Competition for the Minneapolis Riverfront. 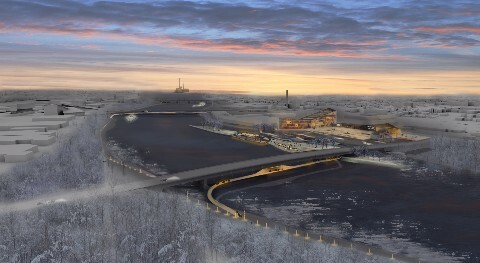 The sponsors, including the Minneapolis Park and Recreation Board and the Minneapolis Parks Foundation, along with creative partners the University of Minnesota College of Design and the Walker Art Center, called for proposals that developed "new opportunities for connectivity, sustainability, infrastructure, and public space" along a stretch of Mississippi riverfront through the heart of the city. TLA/KVA's RIVERFIRST stood out, according to jury-member David Fisher, Superintendent Emeritus of the Minneapolis Park and Recreation Board. "The team grounded their proposal in proactive outreach to the community, demonstrated extensive research, and posited several multi-layered solutions unique to these 11 miles of riverfront and the habitat, communities, businesses, infrastructure, and culture intrinsic to our region," Fisher said. Some of the river reaches have been in bad shape for years, others started to make a comeback in the wake of regulations that cleaned up industrial practices along the river in the 1970s. Still, there are impacts from melting snow and ice carrying street salts, homeowners using phosphate-laden dishwashing detergent in the watershed, and storm water runoff. TLA/KVA and its partners conducted a comprehensive storm water management plan for the city, including opening up and day-lighting water in pipes that feed into the river, according to Kennedy of KVA. The team then designed plantings to act as a natural water treatment facility, including wetland plants and trees that are native to the Upper Mississippi floodplain, such as weeping willows, cedars, and cottonwoods. 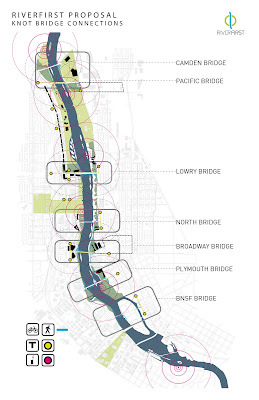 "We also wanted to change the way people interact with the river," said Kennedy. "Especially in reaches that had previously not allowed pedestrian access." The need for greater connectivity, perspective, and access led to the creation of a series of rising berms providing an overlook of the river, and a mobile app and solar-powered Wi-Fi network called "River Talk," which allows for an interactive experience of the river's ecology along strategic points. Real-time water monitoring from the Minnesota USGS website will be made available via energy-efficient illumination along Knot Bridge linking the Northeast Arts District with the proposed River City Innovation District and Downtown. "The idea is to link physical bridge connections -- between the west and east sides of the river -- with connectivity to the digital world," Kennedy related. "The Project is a big responsibility," she said. "We tried to take it seriously, but more to the point, we tried to imagine the river as a municipal ecosystem services provider." What RIVERFIRST will provide when the project is completed, is reclamation of the river for the communities of Minneapolis, one that matches the needs its people with the river.